I voted in California tonight for the first time today. It was incredibly thrilling. The ballot was unfamiliar to me which made the process that much more exciting. Voting in Oregon and Washington, I only got to fill in circles with a pen or by punching holes. It was all manual, at-home style and not in the least bit thrilling. Tonight, there was a strip of paper with numbers and circles like a scantron form that slides into a plastic holder. 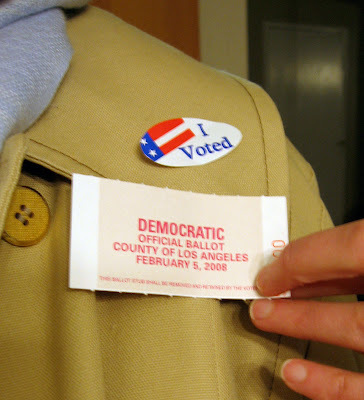 The top of the holder has a laminated booklet with holes for voting. To cast a vote, you push a thick marker that has an ink dotter at the end into the slot of your choice. When you're all done, the strip is fed into a machine and you get a receipt, shown above. I was worried about accidentally voting for the wrong thing but of course it wasn't that hard to do. Wearing a new outfit made the day that much more special. I finished this dress just in time. I used McCalls M5519, view B, and cut the size according to my measurements and the size chart. The pattern is advertised as a 1-hour pattern and although I know that is never accurate (for me anyway) this endeavor was far from a 1-hour project. The pattern calls for stretch fabric so I assumed it would be a close fit. I really should have looked at the finished measurements. There is a full 4 inches of ease at the bust in the finished garment. To be fitted, a garment with stretch should have none or negative stretch. Suffice it to say, version one of this dress was way to large. I ended up taking in the sides, back and sleeves and raising the armholes. The finished version is roomy and comfortable and really shouldn't be any bigger. In the process of finagling the size, I decided to add a collar. I didn't face the collar so it's a sort of floppy mock turtleneck. To make the collar I cut a rectangle to fit the opening and fold over for a self facing. The back closes with two buttons. The closure is not really needed because the dress pulls on easily. I like the finished result and think I'll wear the dress a lot. I had to make so many adjustments, I feel like I almost didn't use the pattern. The sizes are just S-M-L style instead of numbers. To use the correct size, I'd need to buy another pattern.